We made our way to Lake View Park Marina and the Trumpeter Swans were about as close to us as possible, which was awesome! There were many great birds there like usual, including many Great Blue Herons, Bald Eagles, Common and Hooded Mergansers, Canvasbacks, Redheads, Greater Scaup, a few Lesser Scaup, and a Ruddy Duck! I love this location because there are always many birds to be seen, and I think diving ducks are great. Here is a short video of one of the Trumpeter Swans. Can you tell why it's called a trumpeter? 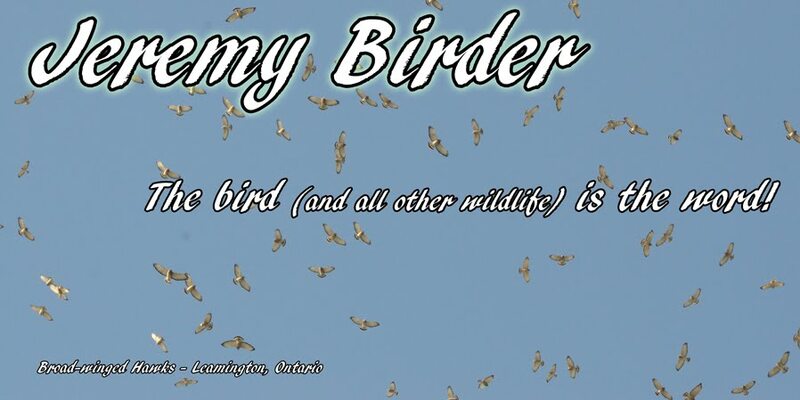 Thank you for reading, and happy birding! This morning I met up with about ten birding friends at Hillman Marsh for one of Paul Pratt's winter birding tours, the last one until spring time. Like usual with these trips, we saw many awesome birds, as well as a bunch of White-tailed Deer and a Coyote, which is always a nice treat. Upon entering the parking lot of Hillman Marsh, I spotted an American Robin flying overhead, one of few that I have seen lately. We walked part of the trail and came up with a variety of winter songbirds, including many Horned Larks and Snow Buntings, and 2 Red-winged Blackbirds, among others. Then we went to the Southeast corner of the marsh and viewed 6 Greater White-fronted Geese, one Cackling Goose, and some early migrant Northern Pintails among the Canada Geese. I am really enjoying the fact that viewing either of these goose species is becoming a regular occurrence in this area! Who knows how long they will stay here or when we will have such opportunities to see them here again. We also watched 2 Glaucous Gulls fly past over the lake. They are awesome gulls with their very light-coloured plumage and impressive size! At this point I picked up my girlfriend Nadia from my place and we all headed out to Woodslee to our friend Janet's house for lunch. On the way, +Kory Renaud spotted a Snowy Owl in a field which was a great unexpected treat. At Janet's house we had a great lunch and got re-energized for an afternoon of birding, then headed outside to look at both species of nuthatch and the many sparrows, American Goldfinches, House Finches, and Pine Siskin that make a living off her bird feeders through the winter, as well as a very illusive Long-eared Owl hiding up in a tree (photo on right). The Pine Siskin (photo above, taken by my girlfriend Nadia) were my hilight of the birds in Janet's yard, as this was my first time getting a good look at them. Janet also directed us to what appears to be a fully leucistic (all-white feathers with a dark eye, so not exactly but similar to albino) Red-tailed Hawk! Wow, I was nearly speechless when I saw it. I did not expect to see one of these in my first year of birding! Like usual, today was another wonderful day of birding, thanks to great birds and great people to share them with. Thank you for reading! Happy birding! Greater White-fronted Geese at Hillman Marsh! Today girlfriend Nadia and I took a trip to Hillman Marsh Conservation Area in Leamington, where I have been seeing some interesting geese lately, including Greater White-fronted Geese (normally found in Western Canada, but small groups of usually 1-4 show up in Ontario during winter), Cackling Geese, 1 mostly white Snow Goose, and 2 white Ross's Geese. Today, like usual, Hillman Marsh was once again very generous to our birding appetite. On our last visit here we checked out the Couture Dyke path and found open water, 2 Cackling Geese, and 19 Greater White-fronted Geese, so naturally this was the path we chose today. The drive from Windsor hinted at good birding to come today, as we saw 17 Red-tailed Hawks and 2 American Kestrels! We keep a 'high score' of the most hawks we have ever seen between Windsor and Leamington, and this trumped our previous record of 15. Tomorrow morning will be one of Paul Pratt's group birding trips, to Hillman Marsh. That should be exciting, as I have not walked the main path in a while. Maybe we will find some early spring migrants! I hope you enjoyed my thoughts on today's adventure. I then took a short drive to the West side of the Ojibway Tallgrass Prairie Reserve, where I have been seeing a Northern Shrike (first found by Brad Hamel on my birthday, December 10), and found it across the street, hunting from some abandoned hydro lines behind the closed Windsor Raceway. I watched it dive down a number of times, but like usual, return empty-handed. I know it is successfully hunting in the area because it has stayed for over 2 months, and a friend of mine saw it `butcher` a small rodent. The Northern Shrike, Lanius excubitor, is a species of songbird that evolved into a predator, so it cannot use powerful talons the way that raptors and owls do. After making a kill using only its beak, it impales its dead prey on a barb or thorn to be tenderized by the sun for easy dismemberment and eating later on. Thus, the Northern Shrike is nicknamed `The Butcher Bird` because of the way it 'butchers' its meal. Sure, at first thought this seems disgusting, but isn`t the this bird's food preparation closer to our own food prep than any animal you know of? The Northern Shrike is probably my favourite species of bird because of its unique and intelligent method of hunting and eating! I captured some pretty interesting video of the shrike looking for prey and taking off from its perch. Also, I am pretty sure that I saw one of the local pairs of Red-tailed Hawks copulate today. They were far away so it is tough to say for sure, especially since copulation only takes seconds and I am not sure if it is late enough into the season yet, but they sure seemed to 'land' in the way that songbirds do when they copulate. "Get a room you two!" Call me crazy, but I tried something today that many would call extreme: I went for a walk barefoot! Ah, it was only a few degrees below zero and it was only about 500m of walking haha. I did this a number of times in the summer and fall, but figured my coat, sweaters, and four pairs of pants would keep me warm enough, and they did! It was a rather comfortable walk actually. The only uncomfortable part was walking through puddles and muddy gravel right at the end. I hear 'barefoot backpacking' is a growing trend in hiking, so I figured I'd join in. I really felt more connected to the forest while walking barefoot (okay, so maybe I'm a bit of a nature-hippy, but I'm a birder! Aren't we all sort-of hippies and/or geeks in our own way?). Overall, it was a fantastic day of birding, like usual! Birding This Weekend - First ever overnight birding trip! Hi, and welcome to my blog! Seeing as this is my first ever blog post, I figure I'll write about my first ever overnight birding adventure a few days ago! I've been birding every day in Essex County since I started last year, but this weekend I visited my friend +Josh Vandermeulen in Cambridge (many thanks to him and his family for letting me stay there) and we did a heck of a lot of birding (and driving) between Sunday, Feb. 17 and Monday, Feb. 18, adding a total of 10 species to my life list! On Sunday, I met up with Josh in the morning and we headed to Niagara then Hamilton, where we stopped at a number of great birding hot spots. I particularly loved seeing the male breeding plumage King Eider, hundreds of Long-tailed Ducks, high numbers of white northern gulls and thousands of gulls in general (even though most were too far away to identify). I heard Niagara Falls is one of the best places in North America to view gulls, and I quickly found out why! 5. Niagara - St. Catherine's - 5th Ave.
ducks - 10 different species! 1. Durham - Kendal - Langstaff Rd. 4. Wellington - Puslinch - Ellis Rd. Wow, what a weekend of birding! Four new life birds Sunday and six new life birds Monday! I haven't added this many birds to my life list in such a short time since my first couple months of birding(which was not really that long ago...)! It's funny that one of the only birds I planned to add to my life list this weekend was a Barred Owl, and due to the many rare birds in the area, we did not even bother looking for one! Needless to say, I do not feel like I missed out by not seeing a Barred Owl this weekend. That's what next time is for! I cannot wait to go back and see more of the great birding this area has to offer. I'm sure most of the awesome birding and species this weekend would not have been possible had Josh not shown me around and let me stay with him, so here's another big thanks to Josh! I look forward to my next visit to that area! Well, there is my first blog. Hopefully it saves so I do not have to rewrite it! Enjoy.